Web-based bulletin board Pinterest now drives more referral traffic to other sites than microblogging site Twitter, according to a recent online sharing tool Shareaholic. Shareaholic’s numbers indicate that Pinterest beat Twitter during the month of February. Pinterest remains an invite-only site. Shareaholic’s data is based on analytics from 200,000 publishers in its catalog which reach about 270 million unique visitors per month. Shareaholic’s previous report found that Pinterest outpaced Google Plus, LinkedIn and YouTube combined for share of referral, according to a post by Janet Aronica. Twitter and Pinterest, however, cater to slightly different audiences. While Twitter is a share-heavy platform, it focuses on text and linked updates that are 140 characters long. Pinterest is a “digital collage” of photo and link sharing post that is “naturally inclined to drive referral traffic,” wrote Aronica. While Google referral traffic (not search) grew by 0.23 per cent from January to February, Pinterest still beats it out by 0.14 per cent. Don’t credit Google Plus with Google’s referral traffic growth, though. 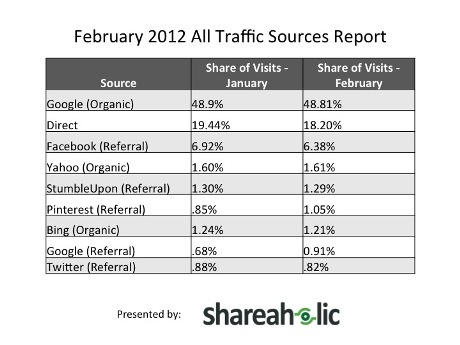 Referral traffic from Google Plus held steady at .05 per cent of all traffic from January to February. For context, that’s the same percentage of traffic referred by Yahoo Answers. It’s always interesting to check up on the once-popular MySpace – In February it referred .0007 per cent of all traffic, down from .001 per cent in January. Organic search dominated, delivering more than 50 per cent of the overall traffic. Google was the most popular search engine, followed by Yahoo and then Bing. Never the shiny new object, Stumbleupon continued to dominate as a traffic drive – sending more traffic than Pinterest, Twitter or Google referral traffic.